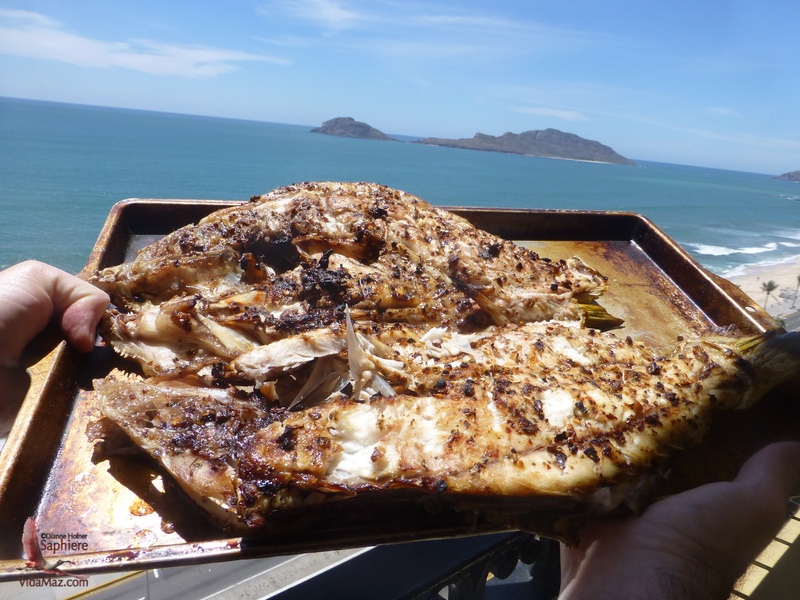 You most probably love zarandeado—the barbecue fish that is so iconic here in Mazatlán—as much as we do. We’ve ordered it from our friends at Pili on Stone Island for at least l5 years, and in Costa Marinera and other restaurants here for about 30. It is generally cooked over an open wood fire, and it ROCKS! We also love Pescadería del Mar in Playa Norte. We’ve visited the fishmongers there three times a week every week that we’ve lived here. In addition to fresh fish brought in from the fishermen across the street, they make fresh paté of marlin and tuna that’s the best in town, and only 50 pesos a pack. They also have some of the best fresh-smoked marlin and tuna around. They are so helpful to tell us what’s in season, what’s fresh, and even how to best prepare our different local fish. Of course, I also teach them a bit about how to prepare more international dishes, but that’s beside the point. NOTE: the photos below were not taken today, but on an earlier visit. Click on any photo to enlarge it or see a slideshow. The point is that this morning we got to the fishmonger rather late. The only thing that looked good to us was fresh pargo, and it was huge for two people—over two kilograms. Perfect for a zarandeado! But what’s the catch? In all these years, we have never before prepared a large zarandeado at home, and we were, honestly, a bit intimidated. You perhaps prepare this lovely dish at home all the time. With the low price of it in restaurants, there’s no real need to do so. But, our fishmongers gutted and split the pargo, all ready for us to take home and barbecue. I washed it and sprinkled spices on top. Greg then put it in the fish-griller-thing-a-ma-jiggy that our friend gave us years ago, and put it on the grill. It turned out perfect—juicy and succulent and oh-so-savory—and it couldn’t have been easier! If you have by chance not yet tried to do zarandeado on your own, please, don’t worry. Greg tells me to be sure to heat the grill and the fish holder well before cooking, and remember to oil the fish holder. He warmed the grill on high heat and turned it down to medium to cook the fish. After about 20 minutes—oilá! It was magnificent. And we now have terrific fish for the next couple of days. Thank you, griller extraordinaire. It’s wonderful to have a “virginal” experience with you today. I know we will be barbecuing many more fish over the summer, thanks to this success! Congratulations to you both! You have inspired me to be adventurous and try to emulate your grilling skills. Your meal looks absolutely delicious. So good to hear from you, Heidi dear! Greg will grill for you anytime; you just let us know! Ditto, Karla! Thank you for your support. Are you still in town?